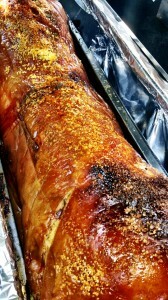 How about a hog roast in Livingston for your upcoming party or event? We’ve been proudly serving the largest town in Scotland’s West Lothian for some time now, so we know a thing or two about helping customers to celebrate all kinds of special occasions locally. Whether you’re planning a themed party at Deer Park Golf & Country Club or a knees-up at home in your back garden, a wedding reception at one of many great hotels in the region or at stunning castle venue, we have plenty of menu options to choose from, no matter your amount of guests, location or budget. It’s never a dull moment catering in Livingston. Earlier this week, our team catered a wild children’s party with a jungle theme in Deans, where both the adults and kids turned up in fierce animal fancy dress costumes and then munched away on our delicious hog roast. The animal sounds and screams are still ringing in my ears! While hog and spit roasts used to be considered food for posh events and formal weddings, people now see them as suitable for any kind of occasion, and we have to agree. We’ve catered so many different kinds of events locally over the years, including corporate parties for staff training or to welcome big clients onboard. Just yesterday, we had the pleasure of serving more than 200 guests at a formal business party in Almondvale, where we welcomed everyone with glasses of bubbly and tasty canapés, then provided a yummy starter served to the guests at their tables, a scrumptious buffet hog roast where the queues snaked round and never seemed to end, all followed by a gorgeous homemade dessert. Both the hogs for this event were stripped clean as many guests enjoyed seconds or more, and we were inundated with compliments about the quality and taste of all of the food, especially the locally-sourced pigs. From Craigshill to Howden, Ladywell to Murieston, we can easily cater areas in around Livingston, and we often do. You’ll have smelled the wonderful aromas of one of our hogs roasting away in our lovely 12th century Livingston Village and some of the surrounding country houses or of course in the New Town. While most of this area was open farmland until 1962, in recent years we’ve grown to accommodate thousands of residents, as well as visitors to our great town, and at the heart of the people is a love of food, including our delicious hog and spit roasts.